Citizens! I had a conversation this week around net neutrality and some French entrepreneurs around the table did not believe at all that Diaspora could defeat the “big” Facebook. Well, big, if you think twice, you can easily remember it’s a younger network than my own studies period, so as “evidences of relevance” are not so…evident. Moreoever, I like the MySpace example and the Facebook one. In the early ages of Facebook, no one could think there’d be a massive translation from a network to another. 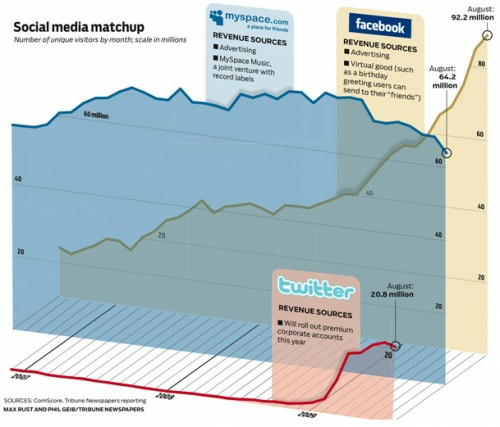 It was in a sense pretty easy in the MySpace to Facebook in France, as MySpace was mostly perceived as an entertainment platform for us against a “friend management system” for Facebook. Different usages, so as a market gap that was filled. Something absolutely different in the US where MySpace was an interpersonal network, a true Social Network on your whole life. And it finally happened: people moved to Facebook, or added Facebook to their digital identity. And Facebook & MySpace can now be synchronized. For Diaspora, the challenge is big: be able to mobilize general public to move to is platform, against the Facebook one. Something complicated as every mobile device providers pre-install Facebook or Twitter. There’s been a wide PR coverage about new Facebook competitor. Every single news magazine diffused interviews, opinions, articles, about this new player. There’s been a great mobilization online, from diverse communities: the founders are not just “geek” people, they’re also like us: citizens, fed up with Facebook Califorinia laws. Fed up with this Teddy Boy called Mark Zuckerberg who wants to control our social graph. There’s obviously an explicit expectation. And when it comes to social networks, explicit networks play a great role. For instance, if Viadeo, the French professional network, worked so well, it’s because during the summer of its launch, the salesmen & founders called their C+ friends to join the platform. For explicit reasons. They transferred their whole address books. Then they added or made implicit networks play the prescription mechanism on its own. On a daily basis, anytime I meet an interesting professional contact, based on my experience, I can decide to explicitely add someone. On Diaspora, there’s both an explicit reason to join, and an implicit mechanism which can lead to a massive interest from the general public. Maybe I’m too Android-minded. Maybe.